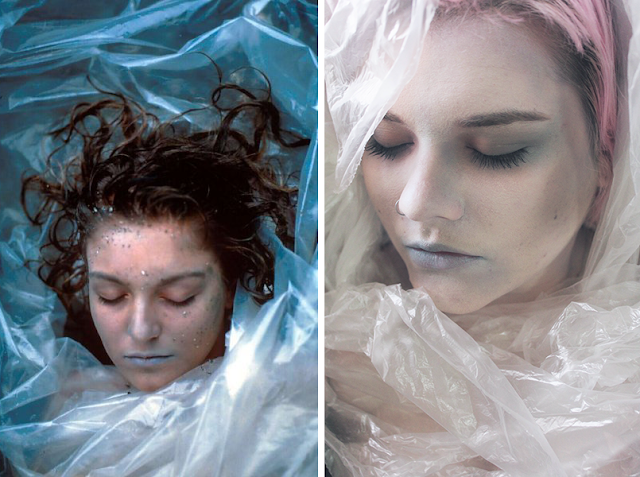 my friend munster: Who Killed Laura Palmer? It's almost the most wonderful time of year again, and I'm a little behind on my usual Halloween posts! 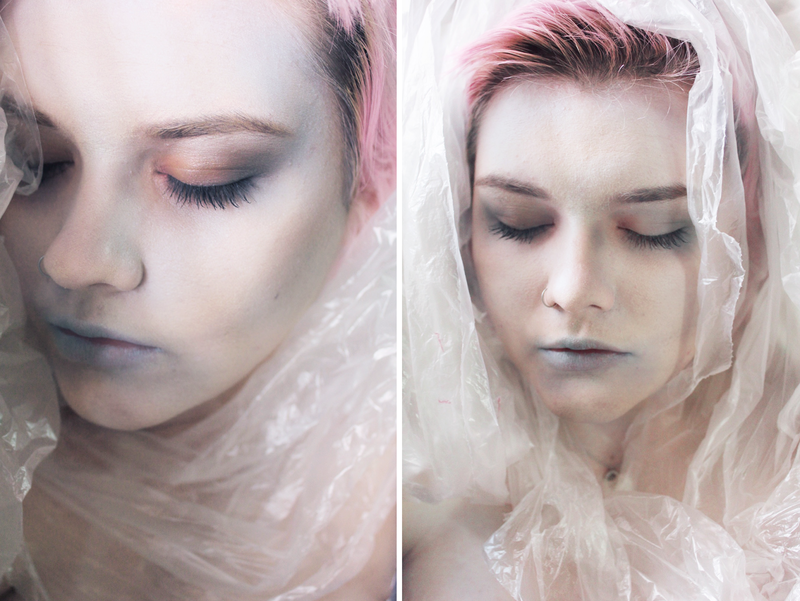 Today I finally cracked open my makeup bag and decided to try my hand at a look inspired by one of pop culture's most enduring images - Laura Palmer, wrapped in plastic and washed up on a river bank. To do this I buffed on my lightest foundation (Revlon ColourStay in Ivory) with a bit of white eyeshadow mixed in because I didn't have any white face paint handy. I then used my Rimmel concealer stick to lighten my face further, and powdered it with a white translucent powder. I used my regular contour shade for my cheeks, and then went over it with a bit of grey eyeshadow to give myself a really dead, sunken look. I went over all of the pinker areas of my face with matte light blue and grey eyeshadow because of course when you're dead there's no oxygen in your blood, and when there's not oxygen in your blood it isn't red, so a corpse isn't going to have any redness at all. For the eyes I used a light orange base, with a darker orange on the inner corners and blended out into a mix of blue and grey around the outer corners. I tightlined my upper lash line with a black pencil, and used my regular mascara and eyebrow routine. For the lips I first covered them with concealer and a little white eyeliner because my natural lipcolour is very pink so I needed to cancel out as much of that natural pigment as I could. I then dabbed a bright, baby blue eyeshadow on them, and a little bit of grey in the outer corners to soften them. This was a really super simple look to do, it only took me about 25 minutes and I was able to get away with only using things I already had in my stash so it cost my a hefty zero dollars. The only difficult thing was trying to get the bags to cooperate- I don't know if any of you have ever tried to wrap yourselves in plastic before, but it's very frustrating haha. Oh and if you haven't seen Twin Peaks before, go and watch it! this is brilliant!!! 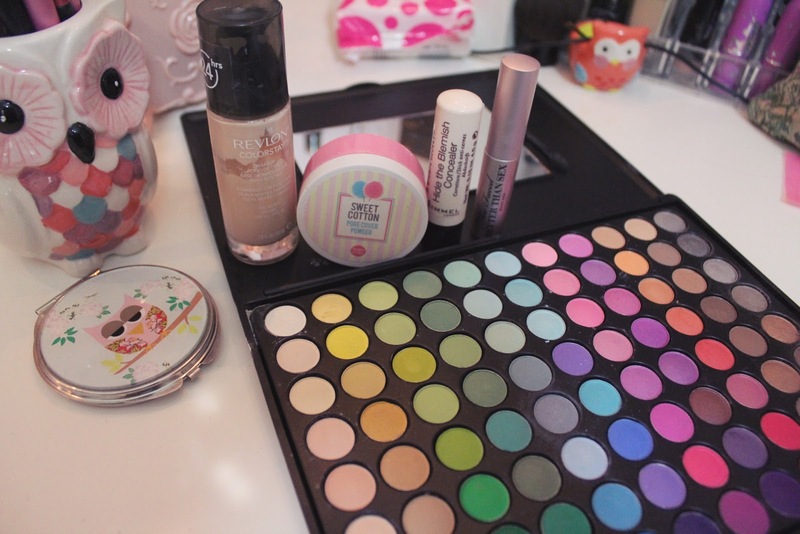 you're makeup looks beautiful + PERFECT!!! you look like a pink haired laura palmer! kinda makes me want to re-watch twin peaks! your favorite gum is coming back in style.